President Donald Trump’s former campaign chairman Paul Manafort has agreed to cooperate with the government and admitted guilt to charges linked to his work in Ukraine. The deal requires Manafort to cooperate "fully and truthfully" with special counsel Robert Mueller's Russia investigation. In return, Manafort will not face a second trial in which he could receive more severe punishment. In a court document, Manafort said he was guilty of plotting against the United States and plotting to obstruct justice. Both charges are related to his work for a pro-Russian political party in Ukraine. Manafort was to go on trial again in Washington next week. Now that trial is canceled. He was found guilty last month of eight financial crimes in a separate trial in Virginia. Trump’s Press Secretary Sarah Huckabee Sanders released a brief statement on the issue Friday. Manafort and his former deputy Rick Gates were the first people charged in the special counsel’s investigation of Russian interference in the 2016 U.S. presidential election. 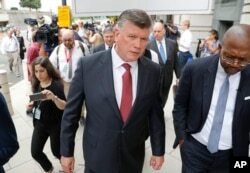 They were charged in connection with their work for Ukrainian political parties and pro-Russian former president Viktor Yanukovych. FILE - Paul Manafort, right, campaign manager to Republican Presidential Candidate Donald Trump, and his assistant Rick Gates stand on the floor of the Republican National Convention in Cleveland, July 17, 2016. In March 2016, Manafort joined the Trump campaign and served as campaign chairman from June to August. He also attended a June 2016 meeting at the Trump Tower with a Russian lawyer. The meeting was described as part of the Russian government effort to help the Trump campaign. Several former Trump aides also have pleaded guilty to charges related to Mueller’s investigation. Last October, George Papadopoulos, a campaign advisor, admitted to lying to investigators about his Russian-related meeting. Papadopoulos has since agreed to work with Mueller’s investigation. 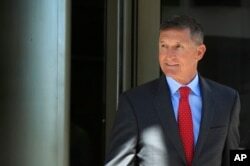 Former Trump national security adviser Michael Flynn leaves federal courthouse in Washington, July 10, 2018, following a status hearing. In December, Trump’s former national security advisor Michael Flynn admitted to lying about his contacts with the Russian ambassador to the United States, Sergey Kislyak. Earlier this year, Rick Gates, who served as deputy chairman for the Trump campaign, pleaded guilty to charges of plotting. He also cooperated in the government’s case against Manafort. Trump’s long-time personal lawyer Michael Cohen admitted to working with an unnamed candidate to illegally buy the silence of two women. The payment dates and amounts are the same as those made to Stormy Daniels and Karen McDougal who say they had sexual relationships with Trump. In February, a U.S. federal grand jury charged 13 Russian nationals and three Russian companies with plotting to interfere in the 2016 U.S. presidential election.